Resorts West manages the finest accommodations at Park City Mountain Resort, Deer Valley Resort and Canyons while providing the highest level of service in the area. Our guests stay with us year after year for the personal commitment we make to ensuring they experience an unforgettable Park City, Utah vacation. 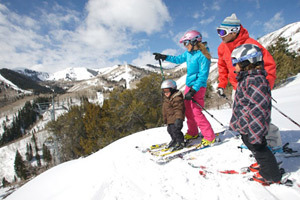 Start planning your Park City ski vacation! "I want to convey my deep appreciation for the interest and time that Kristin [our private concierge] took on Christmas day to locate the Mont Blanc fountain pen that I had left behind at our home at 27 Silver Dollar Drive, and to send it to my home in Los Angeles. Employees like Kristin who handle their responsibilities with good cheer are an asset to Resorts West! Please convey my thanks to her." "It goes without saying we're very satisfied with the service we have received from Resorts West. We couldn't be more grateful for your positive attitude, cheery nature and effective follow-up." "Had a great time! Thanks for taking care of us in a big way. We thoroughly enjoyed our stay, the snowboarding and the food. We’ll do it again next year!"